I found these yellow and green stickers for stihl chain brake handles. The ones you order from Stihl now are white. The seller also has some pretty awesome stickers. 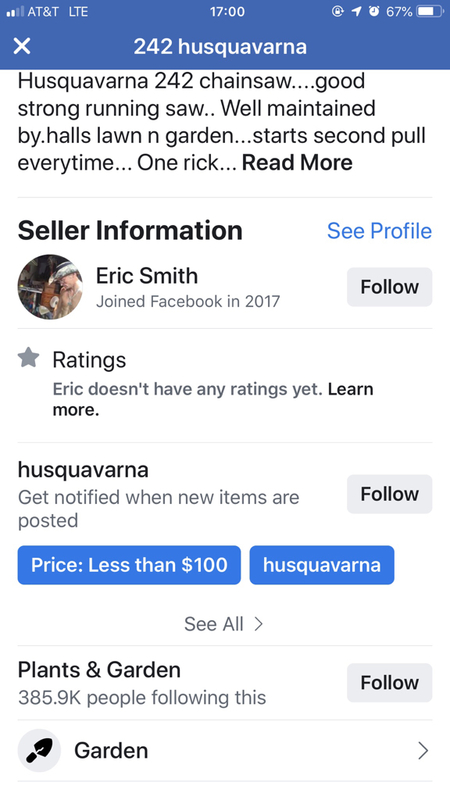 I’m not affiliated with the seller, I just think they have some cool stuff. Wish i was a lot closer to that 242. Wolverine, chipper1 and Cat 525 like this. chipper1 and ranchdadmike like this. That’s a nice score!! I love my 750! Did you get it? How was it? Edit: Just read about it in the snag post! Nice work! Cat 525, dahmer, chipper1 and 1 other person like this. I remember this ad from last year. Maybe he ought to try 20 cents on the dollar. dahmer, chipper1 and CrystalRiver1 like this. Have people gone crazy now days? CrystalRiver1, dahmer and chipper1 like this. Cat 525, chipper1, brandonstclair20 and 1 other person like this. redlight066, CrystalRiver1, chipper1 and 1 other person like this. Some drugs are truly powerful to mess with the mind. Dub11 and GCJenks204 like this. Nice looking red top Dolly 7900. I believe these are decent deals. Would anyone agree? chipper1, Cat 525 and PA Dan like this. If I lived closer I’d own the 59in. chipper1, Cat 525 and J. Loe like this. Yes. Very good. That almost like buying chain and getting the bar free.